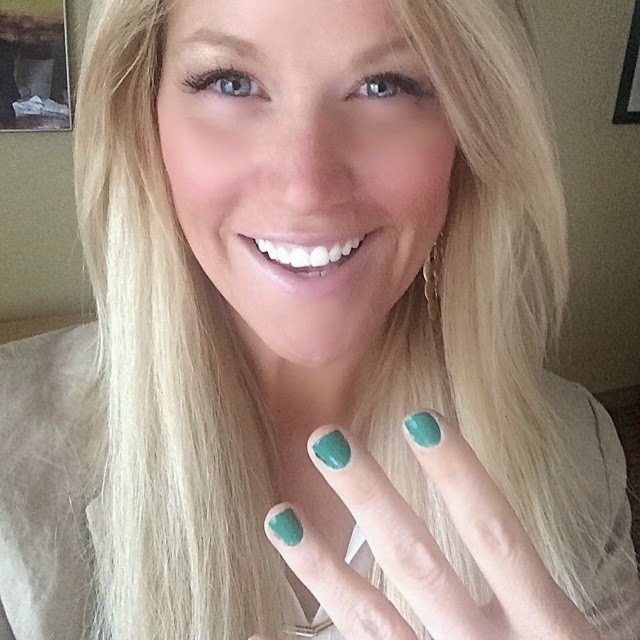 *wearing my LUCKY green Essie nail polish in the hotel room this morning. so much that often I forget that it's actually my job. I am on my way back to Utah. I am at the airport and I missed my flight. Oh yes, I guess I wasn't too lucky today. I actually had the BEST day of meetings (WOO HOO) followed by having an accident in my rental car. I actually did not cry. I knew that I was running late and it was my fault. I have the red paint and big dent on the side of the car to prove it. I talked to myself and just said... "THIS IS A SMALL THING. Let it go..."
So as I told the rental car agent how sorry I was, and that I am just so grateful no one was hurt, she was very nice. She even complimented me on my honesty (yes, I owned it... it was me not seeing the RED POLE). I thanked her and decided to just SMILE and be positive. I am going to be happy even when I do dumb things. Right now, I have such HUGE great amazing things happening for me. At the same time, I have my best friend fighting for his life. I simply take it day by day and know that God is in charge. After my meeting, I called Tyler right away. He is my biggest cheerleader. He always tells me to "GO SHINE." that I don't see myself as. Did I tell you that he googles me? I like to think this is how God sees us. He sees us as so much more then we see ourselves. He loves us faults and all. We are each literally HIS sons and daughters. We are royal in birth. I hope you each have someone who is YOUR anchor. when you are sad. We all need support and help during our life journey. I am so thankful for the knowledge that no matter what Tyler and I are going to be together forever. I believe with my entire being that we are a forever family. This is what gives me the greatest comfort. Today is day 12 of the THIRTY days of INSPIRATION with my brand new LIFE EMPORIUM collection. I wanted to show the CORK (yes, it's CORK) die cut pieces that come with my new collection. 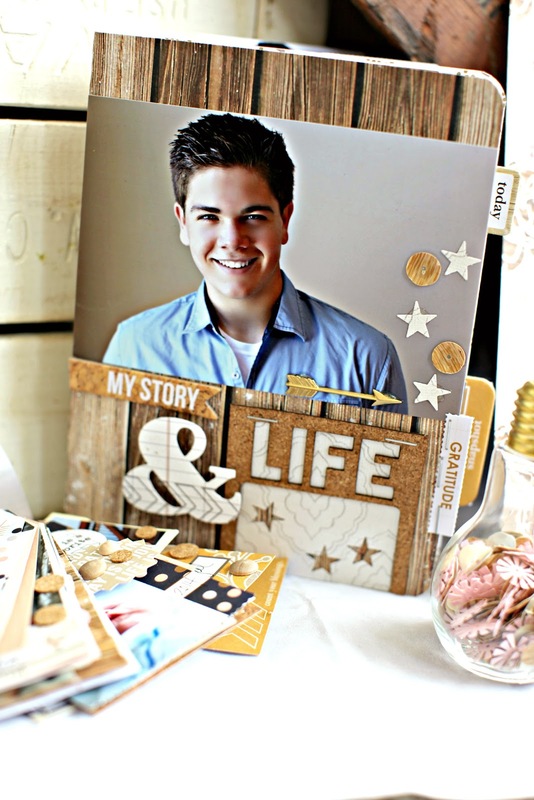 I am LOVING the wood and cork combined and this is what inspired this line... and that it is a line for LIFE MOMENTS. This book is also a workshop that I will be teaching. I am an advocate of telling "our story." This is life right now for my 16 year old. Years from now, he will treasure the photos, what he is saying and the things that are important to him NOW. I am going home to PRINT photos. I am very inspired today to make a collage of photos for Tyler. I want him to be surrounded by LOVE and MEMORIES in the hospital. I want him to see the moments that we have shared and the ones he is fighting for to happen. I believe in living in the MOMENT and when I print these photos... I know I can love them ALWAYS. It's worth printing quality photos. I will use my Canon PIXMA iP8720 because I'm obsessed with the wide format, borderless prints. Yes, 13" x 19" size capability is my dream come true. Time to board the flight. So excited to get home... even if it takes me a little longer. Teresa, remember when you lost your luggage and you told the guy at the airport, it's just stuff? Same with the car, it's just a car, plus it was a rental! Praying that Ty is in remission and praying for you and your family. You are loved! Wonderful album, love the cork. Hi Ms Teresa, I hope you don't mind, but I am going to use the same phrase Ty uses for you "go shine" for my dad. He is in remission with leukemia, but this week they found a large mass behind is eye that is inoperable because of the location, so they are starting aggressive radiation next week. He is 79 years old and so incredibly positive about all of this. He inspires me so much. I am his head cheerleader with is fight (my sister is next in command!). Because you write from your heart and you are so positive, you, too inspire me to be positive. Please know I pray for your family on a regular basis.